One of the great epics of ancient Greece, the Odyssey tells the story of the struggles and triumphs of the hero Odysseus as he made his way home after the Trojan War*. Pursued by the sea god Poseidon*, but aided both by his own cunning and by the goddess Athena*, Odysseus overcame countless obstacles during his long journey home. Along the way, he lost his ships, his crew, and the riches he had gained at Troy. The Odyssey is believed to be the work of the Greek poet Homer, who also composed the Iliad. This mosaic from the A . D . 300S illustrates an episode from the Odyssey. Nearing an island, Odysseus and his men prepare to meet the Sirens, sea nymphs who lure sailors to death with beautiful singing. The Story Begins. The Odyssey opens with Odysseus stranded on Ogygia, the island home of the enchantress Calypso. Almost ten years had passed since the end of the Trojan War. All the other Greek heroes were either dead or safely back in their homelands. Only Odysseus had yet to return home. Calypso was holding the hero captive, hoping that her beauty and offer of immortality would make him forget his wife, Penelope, and marry her. Finally the gods took pity on Odysseus. Athena encouraged his son Telemachus to go on a quest in search of his father. The young man traveled to Pylos and then to Sparta, where he met Helen and Menelaus. Telemachus was proud when he learned of his father's fame. Meanwhile Zeus* sent Hermes* to command Calypso to let the hero leave. She reluctantly agreed, and Odysseus sailed from the island on a raft. While the hero was at sea, Poseidon sent a great storm that destroyed the raft. Saved by a sea goddess, Odysseus finally reached the land of the Phaeacians. The Phaeacians welcomed the stranger and treated him as an honored guest. In return, Odysseus revealed his name and told the Phaeacians about the adventures he had had since leaving Troy many years before. Odysseus's Tale. 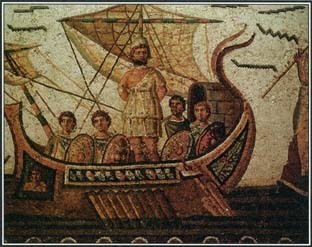 When the Trojan War ended, Odysseus set sail for his homeland of Ithaca with a number of companions in several ships. They first stopped in the land of the Cicones. After sacking the city there, they were driven off and suffered significant losses. Next they arrived at the land of the lotus-eaters, so named because the people there ate the honey-sweet fruit from the lotus plant. This fruit acted like a drug, and when some of the Greeks ate it, they lost all desire to return home. Odysseus had to drag them to the ships and tie them down before he could set sail again. The Greeks next arrived at the land of the Cyclopes, a race of one-eyed savage giants. When Odysseus and some of his men went into a large cave, the Cyclops Polyphemus trapped them inside by rolling a huge stone across the entrance. Polyphemus, a son of Poseidon, proceeded to kill and eat several of Odysseus's men, and the survivors lost nearly all hope of escaping. Odysseus came up with a plan. After blinding Polyphemus with a stake, he and his men escaped the cave by clinging to the undersides of the giant's sheep as they were let out to graze. The Greeks ran to their ships and set sail. Polyphemus hurled rocks at them and called on Poseidon to take revenge against Odysseus. The Greeks landed next on the island of Aeolus, the keeper of the winds. Aeolus listened eagerly to Odysseus's tales of the Trojan War and gave the hero a bag containing all the storm winds. With these winds, Odysseus would be able to sail safely and quickly to Ithaca. After setting sail, however, his men became curious about the bag. Thinking that it might contain gold and jewels, they opened it and released the winds. The winds tossed the ships about and blew them back to the island of Aeolus. Aeolus refused to help Odysseus again and ordered the ships to leave. After sailing for some time, Odysseus came to the land of the Laestrygonians, a race of cannibal giants. The giants destroyed all but one of his ships and ate many of his men. Barely escaping these dreadful creatures, Odysseus and his surviving companions traveled on to the island of Circe, a powerful enchantress. Circe cast a spell on some of Odysseus's men and turned them into pigs. Protected by a magical herb given to him by Hermes, Odysseus forced the enchantress to reverse her spell, and his men resumed their human form. Circe then invited Odysseus and his men to remain as her guests. The Greeks stayed with Circe for a year. She told Odysseus that he must visit the underworld and consult the blind prophet Tiresias before returning to his homeland. Reluctantly and full of dread, Odysseus went to the kingdom of the dead. While there, he met his dead mother, Anticlea, and the spirits of Agamemnon*, Achilles*, and other Greek heroes. Tiresias told Odysseus what to expect and do during the rest of his journey and after he returned home to Ithaca. After leaving the underworld, Odysseus went back to Circe's island for a short stay. Before he set sail again, the enchantress warned him about some of the dangers he still faced and advised him how to survive them. The first of these dangers was the Sirens, evil sea nymphs who lured sailors to their deaths with their beautiful singing. Odysseus ordered his men to plug their ears with wax so they would not hear the Sirens' song. Wanting to hear their songs himself, he had his men tie him to the ship's mast so that he could not be lured away. ship had to pass. Odysseus barely escaped the monsters, and he lost some of his men to them. The survivors reached the island of Helios with its herds of sacred sheep and cattle. Both Tiresias and Circe had warned Odysseus not to harm any of these animals, but his men ignored the warning and killed some of them as a sacrifice and for food. When Helios complained to the gods, Zeus sent a storm that destroyed Odysseus's ship and drowned all his remaining companions. Alone, the hero reached the island of the enchantress Calypso, the point at which the Odyssey began. Return to Ithaca. After hearing the story of Odysseus's adventures, the Phaeacians gave him a ship, and he set sail for Ithaca. This time Poseidon put aside his anger and allowed Odysseus to reach home, but he punished the Phaeacians for helping him. In Ithaca, the goddess Athena appeared before Odysseus and reassured him that his wife, Penelope, had been faithful. She had resisted the attentions of many suitors who desired both her and his kingdom and were occupying his house. Disguised as a beggar by Athena, Odysseus stayed with a loyal swineherd while the goddess went to fetch his son Telemachus from Sparta. When Telemachus returned, Odysseus revealed himself to his son, and together they plotted the undoing of Penelope's suitors. Still disguised as a beggar, Odysseus went to the palace and walked among the suitors. Later that night, Penelope asked to speak with the beggar, whom she did not recognize as her husband. She asked what he knew of Odysseus and told him how she had fended off the suitors. She had refused to marry until she finished weaving a shroud for Odysseus's father, Laertes. She would weave the shroud by day and then unravel her work at night. This worked until her trick was discovered. While they were talking, an old nurse came in to wash the beggar's feet. Recognizing a scar on his leg, she knew him to be Odysseus, but he swore her to secrecy. Penelope announced to the suitors that she would marry the man who could string the bow of Odysseus and shoot an arrow through 12 axes placed in a row. The suitors all failed. Telemachus then demanded that the beggar be allowed to try. The beggar accomplished the feat. Then throwing off his disguise, he and Telemachus fought and killed all the suitors. At first Penelope could not believe that this man was truly her long-absent husband. Only when Odysseus revealed a secret that only they knew—that their bed was carved from a tree and remained rooted in the ground—did she acknowledge and embrace him. During Odysseus's visit to the underworld, the prophet Tiresias spoke of the hero's death. He said that his death would come from the sea when he was old and living in prosperity. According to some legends, Odysseus died at the hands of Telegonus, the son of Odysseus and the enchantress Circe. Urged by Circe, Telegonus sailed the seas looking for his father. Whe n he arrived in Ithaca, Odysseus mistook Telegonus and his men for pirates and fighting broke out. During the battle, Telegonus accidentally killed Odysseus with a spear tipped with the spine from a stingray's tail, thus bringing death from the sea. On the day following this reunion, Odysseus visited his father, Laertes, and learned that the families of the dead suitors were planning to attack. When the battle was about to begin, Athena frightened the attackers away She then assured Odysseus that his reign would be long and would bring lasting peace to Ithaca. The Odyssey ends with this promise of peace and happiness. See also Aeolus ; Athena ; Calypso ; Circe ; Cyclopes ; Greek Mythology ; Homer ; Iliad, The ; Odysseus ; Penelope ; Poseidon ; Scylla and Charybdis ; Sirens ; Tiresias ; Trojan War .